‘Character’ is the keyword here; the sounds and feel created by this instrument that takes us back in time. If you don’t need the centre block, this showy ES-330 is near perfect. 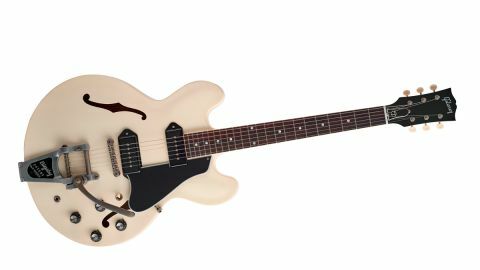 Aside from being a signature limited edition for 2017, in terms of construction, our review model also book-ends Gibson’s ES ‘thinline’ models from the original classic, the ES-335, which spawned the ES-355 and ES-345, up to the latest, the ES Les Paul. Tamio Okuda is clearly a man of taste, mixing the hollow 1959 spec ES-330 with P-90s and a Bigsby. This model is limited to a run of just 150 and is what you see is what you get - there no options. While it’s hard to second guess the price-points and style of Gibson’s often forward-looking USA production range, the Memphis division output has never failed to impress us with an eye firmly on the past. Yet this guitar is not just about replicating the past: along with new design, Memphis is surprisingly cutting-edge, too, employing ‘thermally engineered’ woods - aka torrefication, a process for ‘ageing’ woods and a growing trend for both acoustic and electric makers. Earlier this year, division head Mike Voltz indicated Memphis’s plans to use more of the same, suggesting torrefied mahogany for necks, for example, once the production process has been sorted, due to the more brittle nature of the timber after its heat treatment. Ironically, this modernism is being used to try to nail more closely the weights and sonic response of older vintage pieces. Gibson’s certainly created a more vintage-like appearance with its VOS treatment where both the nitro-cellulose gloss finish is cut back to a lower-gloss lustre and hardware is aged - not distressed - to match. It’s not meant to fool anyone into thinking this is a real old guitar, but it certainly doesn’t look like those box-fresh ‘don’t touch me’ high-gloss pieces, either. The Okuda matches its aged nickel and aluminium hardware, and if the signature artist bit bothers you, the Okuda would simply need a standard truss rod cover to hide its association. The ES-330, originally conceived as a ‘student’ model version of the ES-335, is hollow save for its two longitudinal spruce top braces. The Okuda’s compact neck joins the body at the 16th fret, not the 19th fret of the ES-335 design, and makes it feel almost bigger in the hand than it is. Either way, its big and rounded ‘Traditional C’ profile neck feels huge. The ES-330 does feel a little cramped in the higher positions, but it feels like proper guitars, for sure. It also feels like an old guitar that has been played. It’s no surprise that the jazzy ES-330 and its thrummy hollowness is a perfect bed for the clean MHS P-90s. We just can’t get a duff sound out of this guitar. On one hand, it’s a jazz/blues machine that sounds way more authentic than any other semi to hand, but the way it handles light gains is an equal asset. Watch the volume (it is hollow), but learn to work it and here’s a modern guitar that pulls back the decades, not to mention its wide stylistic use. It’s not cheap, and there’s healthy competition from numerous brands, but there’s something in the Memphis water that makes its guitars rather unique with their old-school build that seems slightly time-warped.